Well, just think about it for a moment. Why would you leave your wing mirrors sticking out when (a) you don’t need them and (b) if you don’t fold them in, they will almost certainly got knocked off by another car squeezing past ? Parking is so limited in Delhi, roads are so ridiculously over-crowded, that every millimetre of road space is precious. And so wing mirrors are often the first things to get knocked, scratched, banged as scooters weave their way through stationary traffic. 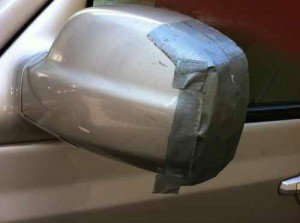 So, either you buy a car without wing mirrors at all, or you fold them in and pretend that are not there. A couple of years ago both my wing mirrors got knocked off, in 2 separate near misses. A DTC bus saw one mirror off, and a tree that jumped out at me when I was reversing, saw off the other. In the week or so that I drove without wing mirrors, my whole driving style changed. I became as recklessly carefree as everyone else on the road. If you can’t see what’s approaching you on either side, what is there to worry about ? Dangerous, but quite delightfully liberating.